A brilliant start to this week, Terry was by the end of Saturday (16 April) at home! Starting the day in Peckham and cycling to Holly Court in Sidcup then onto Greenacres and Ridgemount care homes in Banstead, which is only eight miles from home. I say “brilliant” but it was for both of us strangely unsettling. For five weeks we have had our heads down coping with not being with each other every day, and at the back of our minds that weekend we knew that on Monday he had to start all over again. He has come a long way and being over half way now spurred us on. We spent a lovely family day having a pre-birthday party with three of our four children and their families, which included seven of our 11 grandchildren. Terry found it odd to be in the centre of the family again, but having to get going. The whole family think he is a super star! And have been following the tour closely. 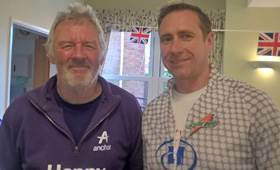 Monday was a good day, the weather was kind and after sending Terry off from home I joined him and Tour Manager Simon Peyton at Moore Place care home in Esher one of Anchor’s newer properties, greeted by lovely staff there. There was a great reception including school children. We then met up with Terry again at the Brooklands Museum in Byfleet, passing him on the way. You certainly appreciate the highs and lows following him, in that I mean the up-hills and the down-hills. As his wife of nearly 50 years, when I follow him, as I did in Manchester for some days over Easter, I can’t say I enjoy seeing the route he takes, both with respect to the traffic and terrain! Brooklands, what an amazing place! The history and iconic racetrack, as well as pristine old vehicles, many of which Terry recognised as having dinky or matchbox versions of in his childhood. Paul Stewart, from Brooklands Museum, then took us to the track where Terry was able to ride a short part of the circuit, a very moving experience. We could have stayed all day looking at the exhibits, which include a Concorde Airplane, but we had to move on. West Hall, in an incredible setting with ponies in fields by the drive in and quite lovely grounds, very serene, a perfect setting for the customers here. Again we were impressed by the caring staff, and we were treated to a three-course meal in the dining hall, with high vaulted ceiling and stained glass windows preserved from the original building. 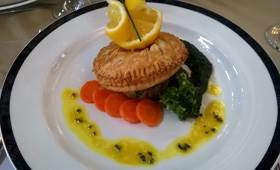 Terry’s favourite dishes had been added to the bistro’s menu that day under the title of Terry’s Choice to mark his visit to West Hall. From West Hall Terry cycled on to Francis Court in Guildford and I drove back home to help prepare for Terry’s visit to our home patch at Willow Glade. I joined our lovely hardworking Social Committee who were decking the lounge and pathways with flags, bunting and balloons. His arrival here was marked by flag-waving friends and a lovely welcome to a bedecked lounge and a beautiful birthday cake and buffet. 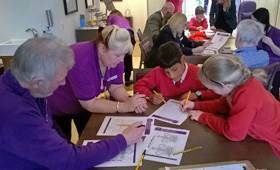 Our daughter Liz came with our three grandsons, also Helen Dredge from the Ageing Well project was there. It was a lovely informal affair with music, singing and some dancing. £185 was raised plus £100 from the social club. So on his actual birthday on Wednesday it was business as usual: pack up the bike, check the routes for the day and wave goodbye again! 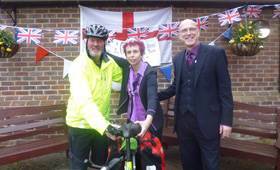 He was joined at Oakleigh Care Home in Godstone by Howard Nankivell and had a good ride with him, right through to Harmer Court in Tunbridge Wells with good weather. On the way, they stopped at Orchard Court care home in Lingfield where the staff had made a lovely cake with a map of his tour of England on it. Since then, for me it has been a couple of days catch up here and watching the Queen’s birthday celebrations in Windsor (Terry and I started our married life 50 years ago in Windsor!) while getting ready to join Terry in Eastbourne on Friday. We lived in Eastbourne for six years before coming to Anchor in Reigate so it will be quite a nostalgic visit, we could maybe have a walk along the prom together! Saturday morning our two sons Mike, who lives in Ipswich, and Andrew, who lives in Hove, joined Terry, so I waved them off, before joining them in Worthing. I have been tracking Terry’s progress every day, as I have been for over five weeks, having updates from the tracker every hour or so! There was me thinking I would have some free time! I had great plans to spring clean, catch up on my painting and the typing up of our travelogues together with scanning photo albums to go with them. In our earlier life whenever Terry had to go away for work, or on one of his crazy bike trips, I coped by keeping busy, throwing myself into a project. But this one has been different, I have been very involved from day one (and some months before) and I must say we have both been amazed by the build up and momentum the tour has taken on. Also humbled by the generosity and kindness everywhere he has been. What a great way for so many Anchor customers to be so involved in the celebrations for the Queen’s 90th birthday! Jacquie and Terry Keen, live at Anchor's Willow Glade retirement housing scheme. This spring Terry is cycling 1,400-miles across England with a 90th birthday card for the Queen.